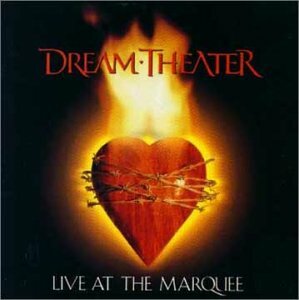 This album represents for me the first time I heard of DREAM THEATER. Recorded at the Marquee Club in London in 1993, the concert was part of a huge tour following the unexpected success of "Images and Words". (Almost) cleverly thought, the set-list simply consists in 2 emblematic progressive metal titles from their first and second albums, 1 new improvisation and... unfortunately 1 soapy song, "Another Day" or "Surrounded", depending on your version... Choose your sleeping pill. Nevertheless, despite the 45 minutes duration, the quality is present. The live renditions of "Pull Me Under" and "Metropolis" touch perfection. If you want me to nitpick, I will just mention the very low volume of John Myung's bass solo. A problem of microphone? "Bombay Vindaloo" is an instrumental jam led by John Petrucci, where he displays his virtuosity. This improvisation offers a nice Middle-Eastern-ish mysterious ambiance, although a bit too long. Only appearing on this disc, there exist no other studio or live versions of this track. However, for the fan, the main interest of this record are undoubtedly "A Fortune In Lies" and "The Killing Hand". Finally, two songs from "When Dream and Day Unite" where James LaBrie replaces Charles Dominici! LaBrie's high- pitched and raging vocals does the justice that these great compositions deserve, making them more aggressive than the originals. His performance, especially on these tracks, is incredible! There is also an alternate opening for "The Killing Hand". Entitled "Another Hand", this enjoyable neo-proggy instrumental was written during the tour to bring a smoother transition to the end of "Another Day".